Marinated and rolled in katakuriko (potato starch. Simply deep fry and serve. 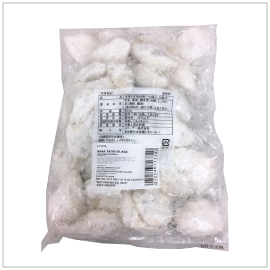 Ingredients: Mackerel, Soy Sauce (Water, Soybean, Wheat, Salt), Sake, Sweet Rice Wine (Sugar, Sweet Rice, Ethanol, Rice, Malted Rice), Ginger, Batter (Potato Starch, Soy Sauce <Water, Soybean, Wheat, Salt>).